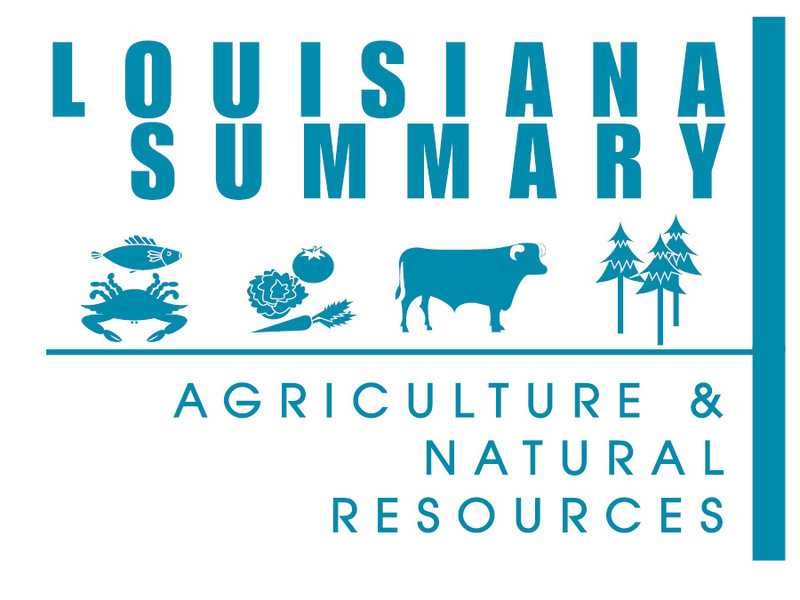 This publication tabulates the value of Louisiana agriculture in 2015. Agents and specialists of the Louisiana Cooperative Extension Service, as well as other agencies – both private and public – compiled the data. Their analyses focus on the animal, forestry, fisheries, plant and wildlife commodities that comprise our vital agricultural industry. Agricultural and natural resource industries contribute significantly to our state’s economy with the potential for increased economic benefits and job creation through value-added processing in urban and rural communities throughout Louisiana. After three consecutive years of nearly ideal growing conditions and record production, the 2015 production year was one of extremes and significant challenges for the agricultural sector. Although the year started out very similar to 2014 with wet conditions, it did not have the uncharacteristically cool temperatures during much of the spring and early summer as was the case in 2014. Higher temperatures, and particularly much higher nighttime temperatures, created significantly more stress on commodities and limited production potential. In addition, heavy rainfall in Louisiana and throughout many northern states created excessive flooding along the Red and Sabine rivers to blunt agricultural production. Excessive rains and higher temperatures in the spring devastated the 2015 winter wheat crop. Reduced yields and poor quality from high disease pressure reduced farm gate wheat values by nearly 50 percent for many producers. The wet conditions that persisted through May and into June 2015 quickly vanished as temperatures reached triple digit levels, and rainfall came to an abrupt stop. Drought conditions started to develop in July and remained through most of the next two months in many areas of the state, with over half of the state characterized as being in either a severe or extreme drought by the end of September. Dryland crops, hay and forage production were all significantly affected. For irrigated cropland, production was also crippled by excessive heat, and their production costs rose due to increased irrigation requirements. The excessively hot and dry conditions did, however, support timely harvest of most crops and helped limit the issues being faced by producers. But, just like the rest of the year, conditions soon changed with a return of excessive rainfall. In many areas of the state, as much as 30 inches of rain fell between October and December. This debilitated harvest efficiency for sugarcane production and reduced sugar recovery for many operations. It also severely limited the ability to plant the 2016 winter wheat crop, resulting in the lowest planted acres levels in the state since the late 1970s. Although extremes in weather conditions during a crop year often create a variety of challenges for agricultural producers, they do not always cause significant reductions in production. Unfortunately, that was likely not the case in 2015. Average yields for many of the state’s major row crop commodities fell significantly in 2015. Year-to-year decreases in yields ranged from a low of 6 percent for corn production to a high of more than 40 percent for wheat production. In fact, the only major row crop commodity that did not experience year-to-year decreases in average yield was sugarcane. Higher sugarcane tonnage in 2015 offset lower sugar recovery from wet conditions at harvest. In addition to the production struggles experienced in 2015, agricultural producers also had to deal with lower commodity prices. After several years of historically strong prices, many commodities experienced strikingly lower prices in 2015. Consecutive years of production growth and expansion simply had outpaced demand growth for many commodities. This has placed considerable pressure on prices. Although prices did not decline for every commodity grown in Louisiana, the overall trend in prices for 2015 was definitely lower. This drop was especially true for major row crop commodities with only sugar prices experiencing marginal price improvement in 2015. The remaining major row crop commodities all experienced lower prices in 2015, ranging from a low of 2 percent for grain sorghum to a high of 23 percent for soybeans. The price situation for livestock enterprises in 2015 was more mixed with several enterprises experiencing year-to-year increases. Prices for most classes of cattle were marginally higher in 2015. Much of that increase, however, was attributable to strong prices early in 2015. By the end of 2015, cattle prices had experienced sharp declines and remained at significant discounts. Prices associated with dairy enterprises also were mixed, with dairy cattle prices being higher, but milk prices being nearly 26 percent lower than in 2014. Finally, for poultry enterprises, prices were lower across all classes of poultry ranging from a low of a 3 percent reduction to a high of 8 percent. Despite any difficulty individual producers may have experienced in 2015, collectively producers experienced only modest declines in economic value for the state’s agricultural commodities. The 2015 total gross farm gate value for the agricultural industry was $6.5 billion, a decrease of 8 percent from the previous year. Plant enterprises dropped significantly in gross farm gate values to $3.5 billion in 2015, a 15 percent decrease, due to much lower returns for soybeans, rice, feed grains and cotton. Animal enterprises generated an estimated $2.2 billion in gross farm gate value in 2015, essentially the same as 2014. Leading the way was the beef cattle industry, which experienced a 7 percent increase from the previous year. Slightly higher number of cattle for sale helped push farm gate values higher for beef cattle. Improvements in this industry were enough to offset the reductions seen in poultry enterprises, which decreased 6 percent in 2015 from 2014 values. Leading the way for the $838 million in gross farm gate value generated for the fisheries and wildlife enterprises were the marine fisheries and aquaculture industries. Increased marine fisheries landings, particularly shrimp, in 2014, the year reported, accompanied with higher prices, reflect the continued recovery of Gulf fisheries from devastation of the oil spill suffered in 2009. The aquaculture sector was primarily driven by the farm-raised crawfish producers, who increased production slightly with higher harvested yields that to some degree helped offset slightly lower prices. Farm-gate value from farm-raised alligators was strong again in 2015 due to high wholesale prices for both hides and meat. This increased revenue from both crawfish and alligator production helped boost total value of aquaculture in Louisiana in 2015. With the increased production experienced in certain agricultural sectors in 2015, value-added activities associated with those sectors of agricultural production also increased. When those commodities were cleaned, processed and packaged, the value-added was estimated to be $5.5 billion. Taken together with farm gate values, value-added activities helped to generate $12.0 billion in economic impact to the state of Louisiana in 2015. Though this represents a 3 percent decrease over 2014, it demonstrates that the agriculture industry continues to be a significant contributor to the state’s economy. Cutting-edge research programs and extension education and outreach efforts remain critical to sustaining these significant economic benefits. Many Louisiana communities depend on agriculture, forestry, fisheries and wildlife for local jobs and their economic well-being. The heart of agronomic agriculture is found in northeastern, southwestern and south central Louisiana. Forestry production occurs mostly in the state’s northwestern hill parishes, and fisheries production takes place mostly along the coast, although aquaculture production of catfish is located mainly in the northeast Louisiana Delta area. For those who work in it day in and day out, agriculture, forestry and fisheries are far more than a business, a major job contributor and an economic engine. It truly is a way of life. Families have lived on many of these farms, forest lands or fishing villages for generations following a preferred way of life even though it means hard work, many hours, high risks and sometimes low incomes. Each new production season has risks associated with commodity prices, trade agreements and higher input costs as well as uncertainty related to the weather. These conditions make the discovery and adoption of new agricultural technology developed by the LSU AgCenter more important than ever to our state’s producers. Agriculture is a highly sophisticated segment of the national and world economy, becoming increasingly so every year. That is the reason we at the LSU AgCenter continue to support agriculture and consumers with factual information provided by a well-trained faculty of extension agents, specialists and research scientists. Those of us in the LSU AgCenter, with its major branches of the Louisiana Cooperative Extension Service and the Louisiana Agricultural Experiment Station, are proud to be part of Louisiana’s agricultural industry, and we are committed to serving that industry and residents across the state of Louisiana in the years ahead.